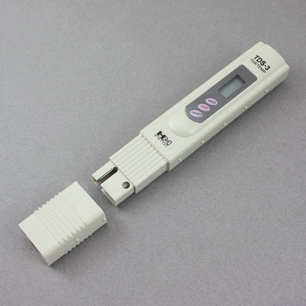 This is a simple but very reliable tester that measures the Total Dissolved Solids (TDS) in water. It gives a reading in parts per million (ppm) of all the dissolved solids, good or bad. Dissolved solids in water are mainly its mineral content. If your tap water, for example, has a TDS reading of 250 parts per million, that means that the total content of the minerals dissolved in the water make up 250 parts per million of the total volume. For practical purposes, TDS measurement is a very effective way to test you reverse osmosis unit's performance. Remove the cover from the bottom of the tester, then turn on the unit by pressing the On/Off button. The display should read 000. Insert the tip of the tester (the end where the cover was) into the water to be tested. A half inch or so deep is plenty. You'll ruin the meter if you submerge it too deeply. Read the numbers on the display. The number you see is the TDS (Total Dissolved Solids) of the water expressed in PPM (parts per million). The Hold button and the Temp button are features you probably won't need. Hold locks the number on the display so it won't go away and Temp measures the temperature of the water. When you're finished, turn the tester off. Note: The tester is factory calibrated. You won't need to calibrate it. Measure the TDS of your tap water, then measure the product water for comparison. The RO water should be about 1/10 or less the reading of the tap water. In other words, if the tap water reads 250, the reverse osmosis water should read around 25 or less. What you are measuring is the performance of the reverse osmosis membrane. As long as you get a respectable TDS reading, the membrane does not need to be replaced. Typically, reverse osmosis membranes last three years or longer. Important: If you are testing a new unit, always wait until it has run for a few days to ensure a reliable reading. It takes quite some time for the newness to wear off the system. If you are servicing the unit, take your test before changing the carbon filters. New carbon filters will corrupt the reading considerably and read much too high. The meter can “see” the manufacturing residue from the carbon filters.